Congratulations to Cate, giveaway winner! Paper Connection International is an importer of specialty papers from Japan, India, Nepal, Latin America, China, Korea and additional countries around the world. The company, which is located in Providence, Rhode Island, celebrated its 20th anniversary this past weekend. As a continuation of the celebration, the owner of Paper Connection, Lauren Sugita, is offering a giveaway and discount code to All Things Paper readers. 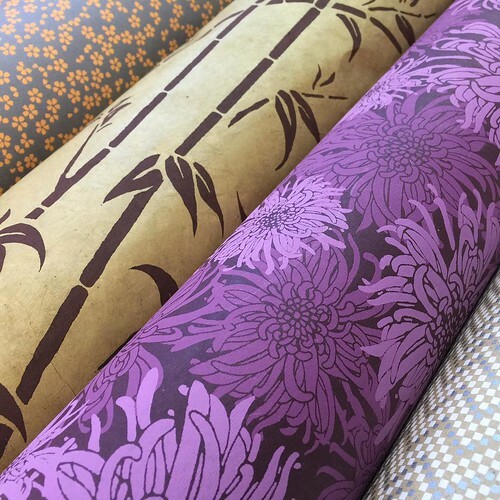 Besides an incredible array of decorative paper in all textures, colors, and patterns, Paper Connection offers stationery, gift wrap, paper rope, blank journals, scrapbooks, kites, lampshades, party accessories, boxes and more. The warehouse contains over 3000 types of paper items! 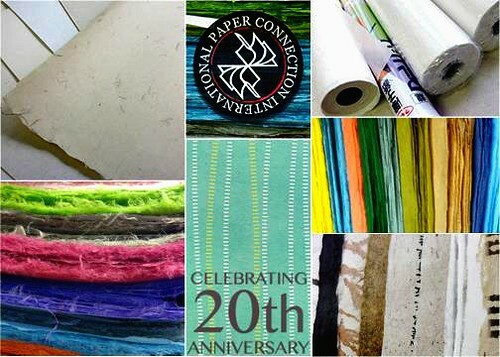 Paper Connection employees offer a wealth of knowledge about handmade and machine made papers and are known for their personal and dependable customer service. Technical assistance can be provided to artists, designers, bookbinders, conservators, manufacturers, museum curators and retailers. The staff at Paper Connection welcomes scheduled visits to the showroom and warehouse, whether an individual, group, or class. Paper Connection is always adding papers and products to the webshop so check back often. To keep up with newly added items, it's best to follow Paper Connection on Instagram and/or Facebook. Now about the giveaway! Paper Connection will be sending twelve large sheets of specialty papers to one person with a U.S. mailing address. These are the actual papers the winner will receive plus two more. 2 sheets of Yanagi Lokta, where the paper is scrunched, in a way, to manifest these wonderful organic stripes running along the width of the paper; in rich fall colors of brown, olives, etc. 1 sheet of Lokta featuring a woodblock of a bamboo scene; great to simply frame! 3 sheets of Crumpled and Dyed papers in yellow, teal, and pink. 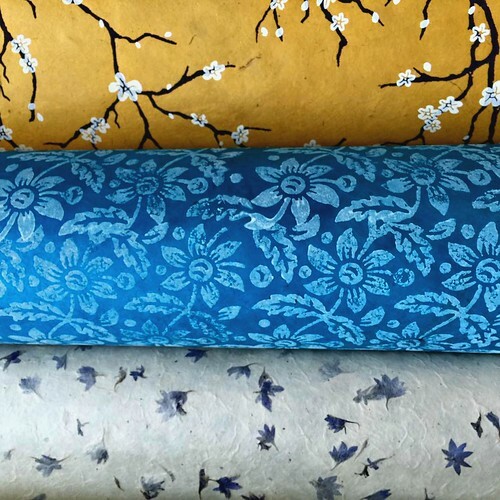 The papers have a fabric-like quality although they are handmade using indigenous vast fibers and traditional methods originating in the An Hui province of China. They are literally crumpled and dyed, rendering each sheet unique. 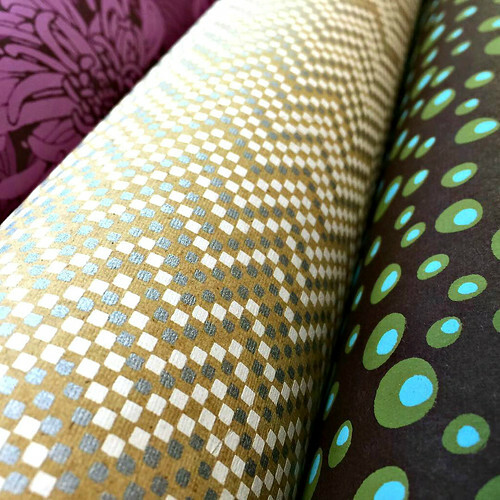 3 sheets of our exclusive Laurelai paper, designed in house using recycled rag cotton in India, silkscreened with two colors, featuring funky, retro patterns. 2 sheets of our new Mini Brocade line, also made using recycled rag cotton in India, with a daisy and squared chevron pattern; additional subtle and sophisticated patterns can be found on our webshop from this series. 1 sheet of our card stock weight Light Green with gold and silver flecks from An Hui. This paper is great for card makers, collage, and all sorts of paper crafts requiring a bit of heft, yet retaining a handmade feel. The value of the collection is approximately $50.00. Examples of sheet sizes are 20 x 28 inches for the Laurelai and mini-brocades, 22 x 30 inches for the Lokta, and 25 x 25 inches square for the Crumpled and Dyed papers. Easy entry: Just leave a comment on this post along with a way to be contacted. If you are on Instagram, you can double your chances by liking the giveaway photo and following @paperconnection and @allthingspaper. The giveaway will run through Friday, November 20, 2015. A winner will be drawn at random on Saturday and announced at the top of this post and on the Instagram photo. One more good thing! Paper Connection has set up a discount code for their webshop. It is 10% off; one time use only. Use code: PCI10. The discount applies to everything except swatchbooks and shipping/handling. What a wonderful array of papers. So interesting, Ann! It's always nice to see beautiful things to start off one's week! @rhymeswithmagic on IG. So beautiful! Thanks for the opportunity to win some. I recognize many of these papers - use them often in my work! I am returning to art making 3/4 time and could really use an infusion of beautiful, new papers for inspiration. Books and collage are my main obsessions. These are beautiful, and I'd love to enter. Hopefully in the future you can use a entry mechanism that doesn't require entering an email address publicly, which sadly in today's internet is an invitation for spam. Hi there, I understand your concern. I have to say my email address is in several visible places on this site and I receive only 2 or 3 spam messages in my gmail inbox daily. Spam filters have been improved greatly in the past couple of years. If you wish, you can spell out 'at' rather than using the symbol to prevent bots from obtaining your addy. People often do that with the thought that it helps avoid spam. Look at those paper! Thank you for the chance. Such pretty paper! I'm already thinking of what they could end up as! Such beautiful looking paper and a nice assortment of patterns. Beautiful papers. Perfect for bookbinding and journal making. Pick me! Pick me! Absolutely beautiful papers! pretty papers.......especially the two toned purple mum paper. thanks for offering this drawing..
What a wonderful collection of yummy goodies. I can already imagine what I'd be doing with them!! Fingers crossed! 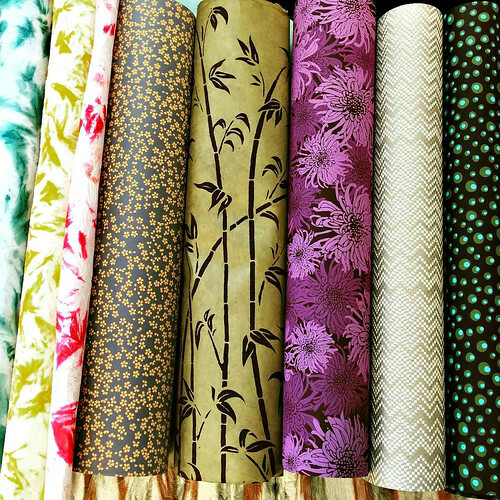 Fabulous collection of handmade papers. You can never have too much paper! 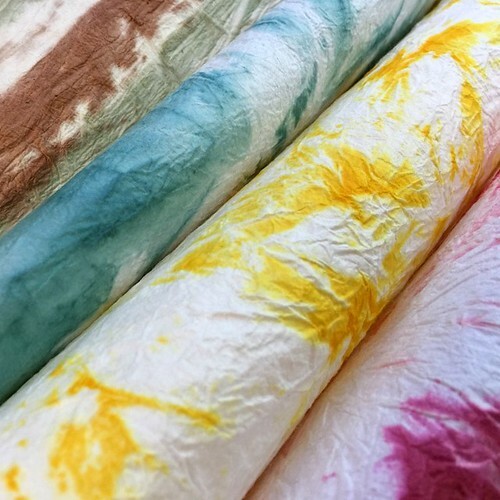 Oh wonderful handmade paper ---- The colors! Thanks for the opportunity to win some. Oh my gosh, that paper is gorgeous. A million possible projects are popping in to my mind. Thanks for the chance to win. Good luck everyone! Simply stunning! Wow - these could be used for so many great projects!!! Thank you for the inspiration. Absolutely beautiful paper. I can see some wonderful ornaments on my tree out of this. Not much chance to win, but want to say how gorgeous these papers are - Certainly inspiring!!! Hi Jan, a much better chance than the lottery! :) I'm glad you love the papers. So glad you like them, Traci! I love your site and the many artist`s work you feature. I checked out Paperwolf again and posted the article to Facebook in case anyone wants to have or gift one of his stunning animals. I would love some real art paper. I tend to use coloured flyers and magazine pages for origami and iris paper folding. My shredder does a good job of turning those pages into quilling size. These are gorgeous! They would look great in many different projects. Having only just starting quilling I was quite taken with info-help and ideas from paper post. Just this very minute discovered these beautiful papers so I could get more creative(@65). Looking forward to searching more on everything- especially flowers -how to and if they are worth making. What a lovely display of the varied paper colors, techniques and uses! I've already thought of so many ways I could incorporate them into my art work! From quilling to folding, to :gosh, who knows what!" PS: I can be reached at ccvinmiami@aim.com if I am a winner and the giveaway is still happening! If not, I will purchase from your website, when I can spend more on such beautiful papers.